Bedford Wives is a South African comedy–drama television series created by Rethabile Ramaphakela and Katleho Ramaphakela which follows the lives of four Bedfordview women and a community of criminals who, on the surface, exude pristine and perfect lives - but behind closed doors are revealed to have skeletons and secrets. Loyal and loving Dee is the perfect mother, wife, head of the PTA at her kids' school and the envy of all the other mothers in Bedfordview. But just as the former Miss South Africa prepares to get another crown on her head, this time for Mrs South Africa, her husband, Marco, dies. He is murdered in his restaurant's own cold room. As if this isn't a cold enough reality, Despina also finds herself frozen out of Mrs SA because entrants must have husbands. Now all Despina is, is the one thing she wants desperately not to be – a widow. Then the will is read. To the horror of Marco's vampish ex-wife Gigi Gianoppolous (Gabriella Cirillo), Marco has left everything to Dee with the instruction to look after everything – and the family. Dee vows she will uphold Marco's legacy – but soon discovers that the restaurant was mainly a successful front for his criminal activities. She was married to a crime kingpin and never knew it! Not to mention the fact that whoever killed Marco is still out there and still a threat. Perhaps even worst of all, rival Gigi knew all about the crime business and is an integral part of it. Gigi wants to take over running it all with her son George (Blaine Shore), but Dee is determined to stop her having any control. If she can't be a Beauty Queen, she can at least be a great Queenpin and support the whole extended family. After all, she owes it to Marco. Still, it's not easy keeping it all a secret from her bored and bossy best friend Yvette (Shaeleen Tobin), who lives her life vicariously through the glamourous Dee, or her supremely nosy neighbour Paulina Salemane (Sibulele Gcilitshana), who stole Dee's PTA Chairwomanship; all while having to juggle it all against school lifts, yoga lessons and being a mother to her kids. There's also the small matter of the ruthless rival kingpin who wants to take over her turf, a police detective determined to solve Marco's murder, and an undercover agent obsessed with unravelling the Bedfordview crime web. It seems like every time Despina tries to take a breath, she uncovers a new secret or deception. 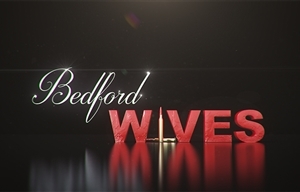 Bedford Wives was created by Rethabile Ramaphakela and Katleho Ramaphakela and is produced by Burnt Onion Productions. The executive producers are Rethabile Ramaphakela, Katleho Ramaphakela and Tshepo Ramaphakela and the head writers are David Gordon and Julie Hall. The first episode was written by T.T. Sibisi and directed by Krijay Govender and Beautie Masvaure. The music is by Samkelo Mahlalela.